Showing items in category British Honduras, sorted by newest listed first. BRITISH HONDURAS - 1940 20c rate commercial censor cover to USA with scarcer Little CL1 label. 1940 (JU.8.) commercial cover to USA bearing 10c pair tied BELIZE/BRITISH HONDURAS with black on cream OPENED BY/CENSOR/BRITISH HONDURAS censor label at left. Little type CL1. BRITISH HONDURAS - 1855 '6' rated stampless cover to UK struck by double arc BELIZE h/s on reverse. 1855 (OC.17.) 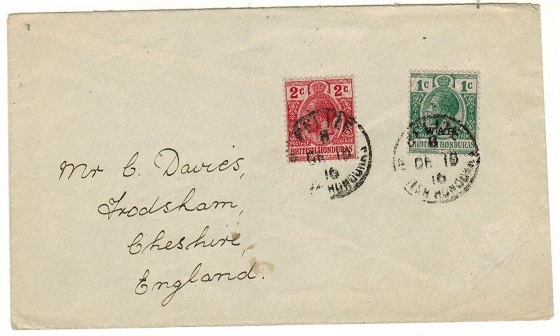 stampless cover addressed to UK rated '6' on front and with BELIZE double arc backstamp. 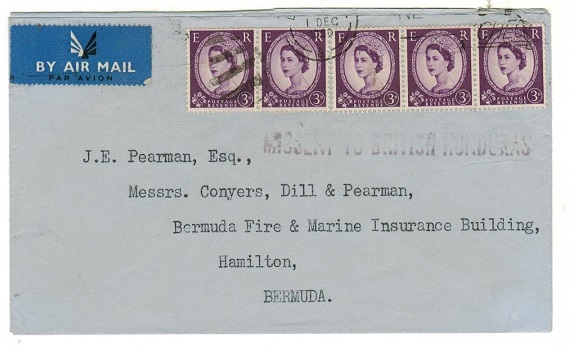 BRITISH HONDURAS - 1960 cover from UK to Bermuda with 'MISSENT TO BRITISH HONDURAS' h/s applied. 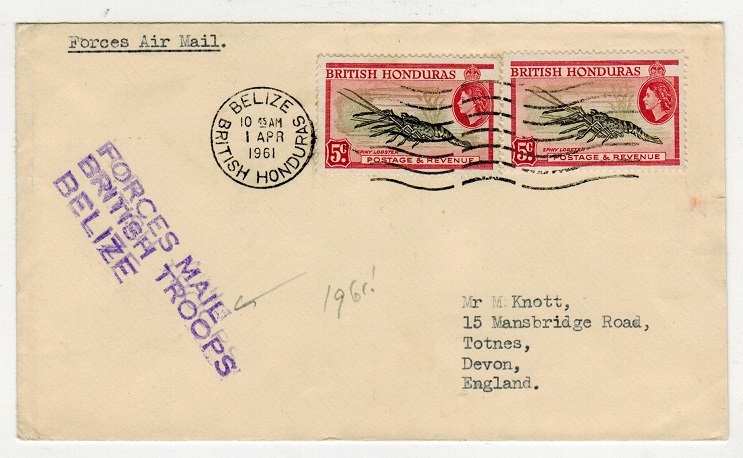 1960 cover addressed to Bermuda from UK but struck on-route by scarce black straight lined MISSENT TO BRITISH HONDURAS instructional h/s with BELIZE wavy lined cancel on reverse side dated 5.DEC.1960. BRITISH HONDURAS - 1971 range of 13 covers to UK from differing Post Offices. 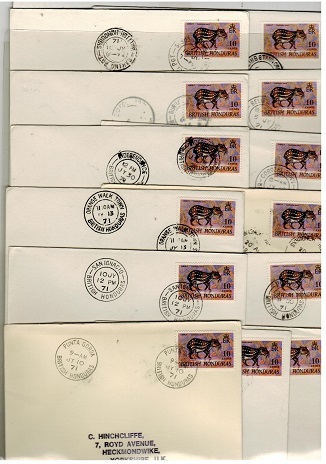 1971 range of 13 10c rate philatelic covers self addressed to UK sent from different Post Offices. BAKING POT, BELIZE CITY, BURRELL BOOM, COROZAL TOWN, INDEPENDENCE, MONKEY RIVER, ORANGE WALK TOWN, POMONA, SAN IGNACIO, SAN PEDRO, PUNTA GORDA SAN ESTEVAN and STANN CREEK. BRITISH HONDURAS - 1914 5c rate cover to USA used at BELIZE. 1914 (MR.20.) cover addressed to USA from the 'American Consular' bearing 5c adhesive tied my BELIZE cds. BRITISH HONDURAS - 1916 2c rate cover to USA with additional 1c 'WAR' stamp applied at BELIZE. 1916 (SP.15.) 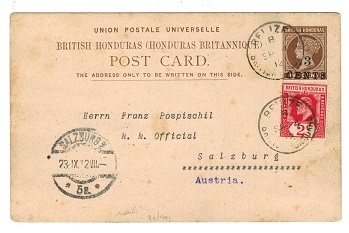 commercial cover addressed to USA bearing the 2c (SG 112) overprinted with violet 'moire' security marking in case the Germans were to capture the stamp stock cancelled alongside 1c 'War' issue (SG 114) by BELIZE/BRITISH HONDURAS cds. A nice cover showing the increased (2c) rate to meet War costs. BRITISH HONDURAS - 1921 5c rate cover to USA used at COROZAL. 1921 (DE.21.) commercial cover to USA (tear at top left edge) bearing 2c and 3c adhesives tied by COROZAL/BRITISH HONDURAS cds's. BRITISH HONDURAS - 1922 4c rate cover to USA used at BELIZE. 1922 (MY.19.) 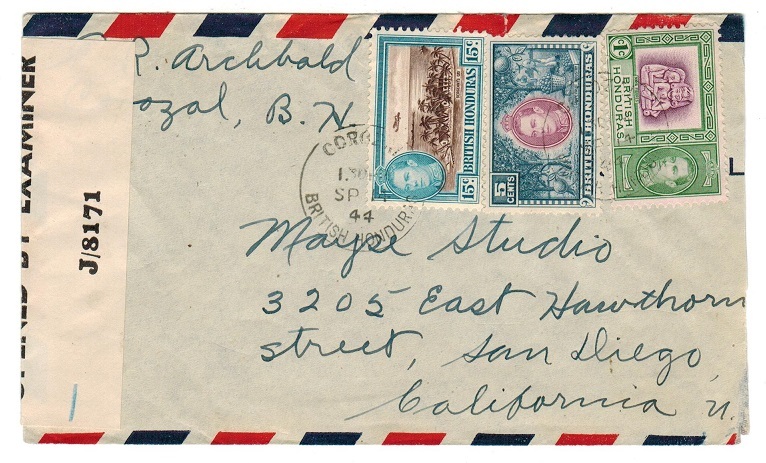 cover addressed to USA bearing 2c adhesive pair tied BELIZE/BRITISH HONDURAS. BRITISH HONDURAS - 1916 9c registered rate cover to USA with 'War' stamp use. 1916 (DE.12.) 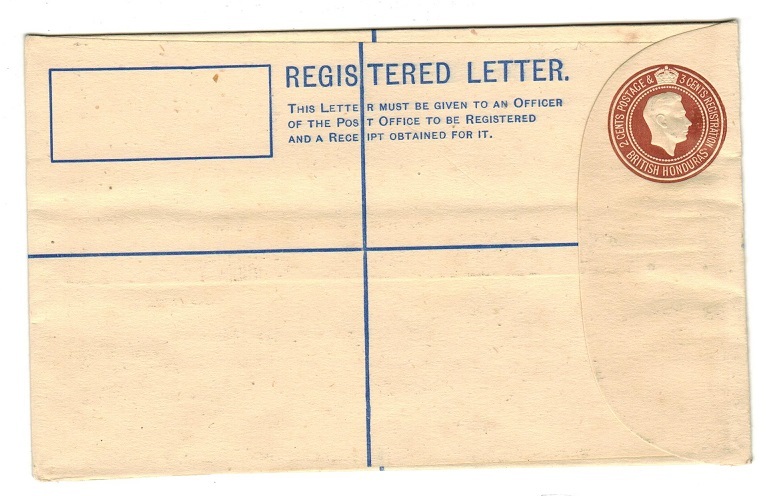 registered cover addressed to UK bearing 1c, 2c and 5d 'moire' adhesives (SG 111-113) together with the 1c 'War' stamp (SG 114) and tied BELIZE/BRITISH HONDURAS. BRITISH HONDURAS - 1916 3c rate cover to UK with 'War' stamp use. 1916 (DE.19.) 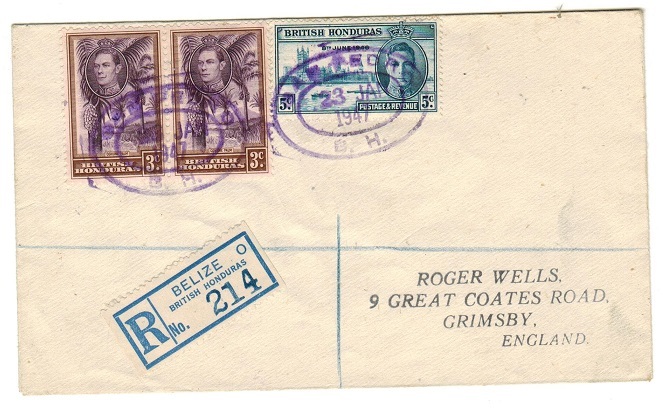 cover addressed to UK bearing 2c 'moire' adhesive (SG 112) tied in combination with the 1c 'War' stamp (SG 114) and tied BELIZE/BRITISH HONDURAS. BRITISH HONDURAS - 1931 2c rate cover to Canada used at CAYO. 1931 (MR.21.) 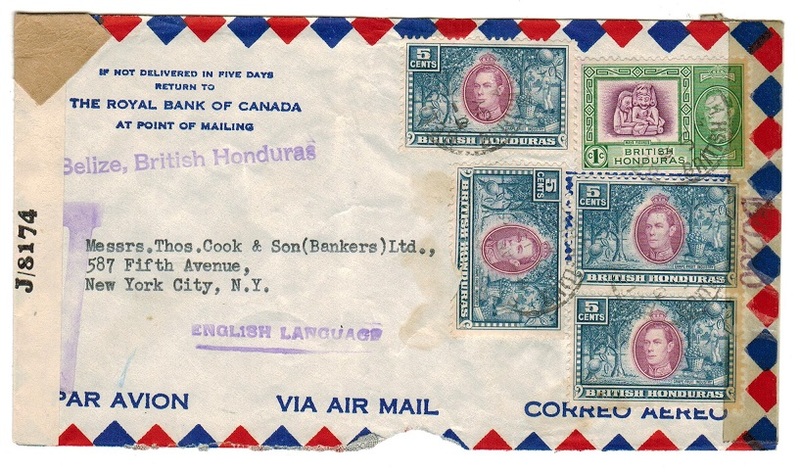 cover addressed to Canada bearing 2c adhesive tied by s/r CAYO/BRITISH HONDURAS cds. BRITISH HONDURAS - 1894 5c surcharged adhesive on cover to USA used at BELIZE. 1894 (NO.30.) cover addressed to USA bearing the 3c on 5c on 3d red-brown surcharge adhesive (SG 49) tied by 'K 65' duplex with BELIZE/BRITISH HONDURAS cds alongside. BRITISH HONDURAS - 1900 5c rate cover to USA used at BELIZE. 1900 (JU.1.) cover addressed to USA bearing 5c ultramarine adhesive overprinted REVENUE (SG 66) tied by BELIZE/BRITISH HONDURAS cds. BRITISH HONDURAS - 1921 3c rate + 1c 'WAR' stamp on cover to USA used at BELIZE. 1921 (NO.3.) cover addressed to USA bearing 3c orange tied in combinationn with 1c green 'WAR' stamp by BELIZE/BRITISH HONDURAS s/r cds. BRITISH HONDURAS - 1909 5c rate cover to Germany used at STANN CREEK. 1909 (JA.7.) 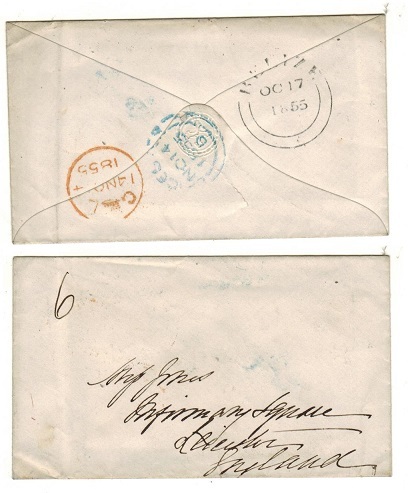 cover addressed to Germany bearing 5c adhesive tied by d/r STANN CREEK/ B.HONDURAS cds. BRITISH HONDURAS - 1919 20c rate registered censored cover to USA used at BELIZE/M.O. & REG. 1919 (FEB.25.) 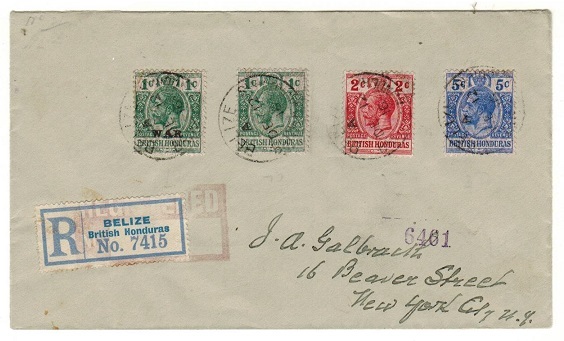 registered cover addressed to USA bearing 5c 'moire' adhesive block of four (SG 113) cancelled by scarce d/r BELIZE/M.O. & REGISTRATION cds (Proud type R17) applied in 'blue' ink. Violet d/r PASSED BY CENSOR/1116 applied on arrival. BRITISH HONDURAS - 1931 25c rate registered first flight cover to USA. 1931 (DE.5.) registered first flight cover to USA bearing 25c adhesive tied REGISTRATION/BELIZE with violet boxed FIRST FLIGHT h/s at left. Carried Belize to Miami by FAM 5. BRITISH HONDURAS - 1935 3c 'Silver Jubilee' pair use on cover to UK struck PAQUEBOT. 1935 (JU.17.) commercial cover addressed to UK bearing 3c 'Silver Jubilee' adhesive (x2) tied by violet PAQUEBOT handstamp with BELIZE/BRITISH HONDURAS cds below. BRITISH HONDURAS - 1955 (circa) FORMULA air letter sheet overprinted 'O.H.M.S.' unused. 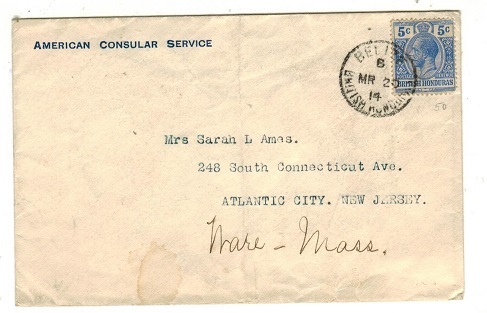 1955 (circa) dark blue on blue FORMULA type 'Air letter/Aerogramme' in unused condition handstamped in black O.H.M.S. on front and with pre printed 'Postmaster General/General Post Office/Belize City/British Honduras' on reverse side in senders name panel. Unusual item. 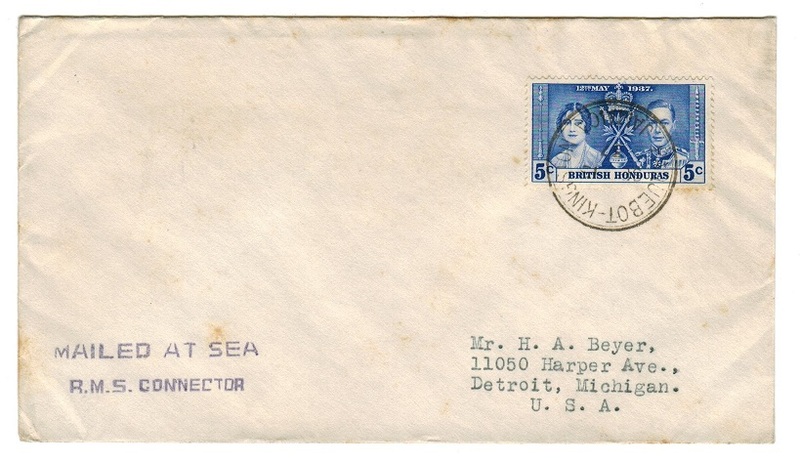 BRITISH HONDURAS - 1937 3c rate 'MAILED AT SEA/R.M.S.CONNECTOR' maritime cover. 1937 (DE.2.) 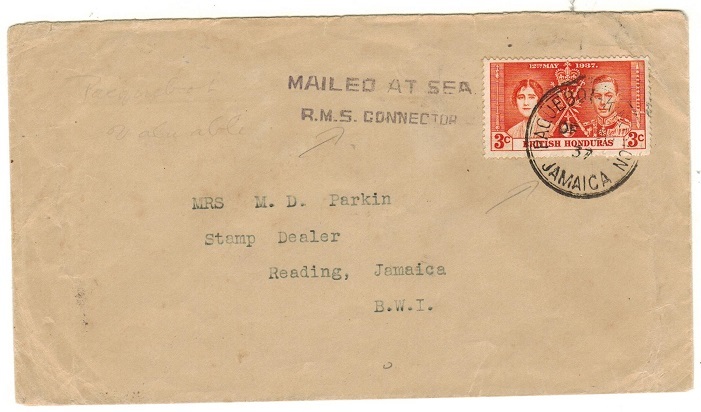 cover addressed to Jamaica bearing 3c orange 'Coronation' adhesibe tied PAQUEBOT/ KINGSTON JAMAICA and with MAILED AT SEA/R.M.S.CONNECTOR maritime h/s at left. BRITISH HONDURAS - 1912 2c+3c brown RPSE to USA used at COROZAL. 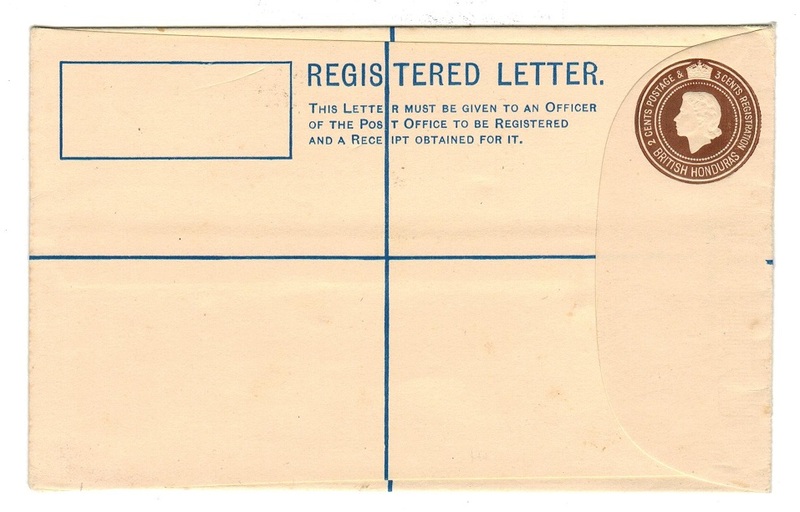 1912 2c+3c brown on cream registered postal stationery envelope (size G) addressed to USA and bearing additional 5c adhesive tied by COROZAL cds dated DE.23.14. Unlisted by H&G in this size. BRITISH HONDURAS - 1938 2c+3c brown RPSE (size H2) in unused condition. Unlisted by H&G. 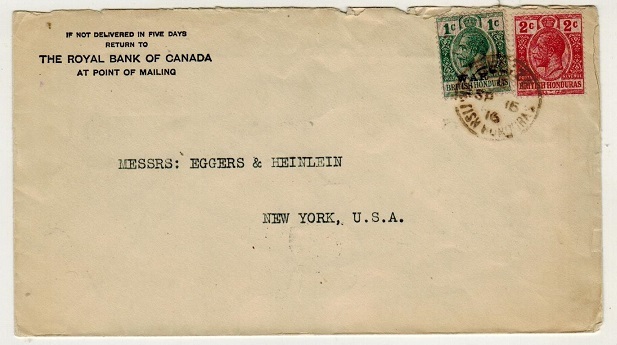 1938 2c+3c brown on cream registered postal stationery envelope (size H2) in fine unused condition. Slight gum fault under flap from adhesion but unlisted by H&G in the size. 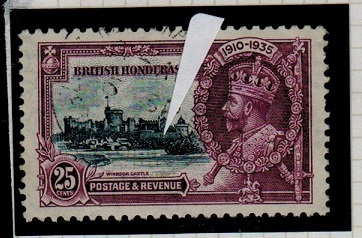 BRITISH HONDURAS - 1935 25c 'Silver Jubilee' used showing the TWO SWANS variety. SG 146. 1935 25c slate and purple 'Silver Jubilee' adhesive in fine used condition showing the TWO SWANS variety. Row 2/2 from plate 3. SG 146. 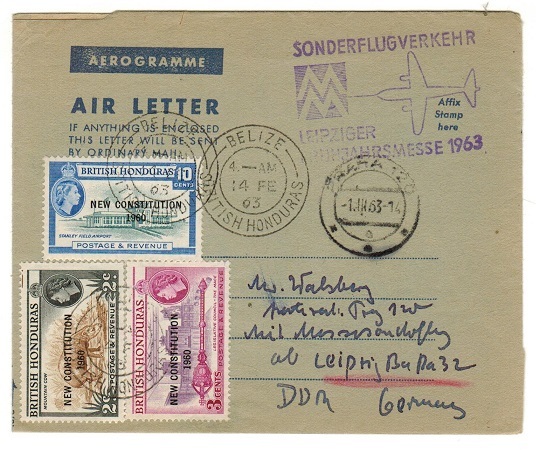 BRITISH HONDURAS - 1963 First flight air letter use to Germany via Sonderflugverkehr. 1963 (FE.14.) use of dark blue on greyish FORMULA type AEROGRAMME/AIR LETTER sheet addressed to Germany and bearing 2c,3c and 10c 'New Constitution' overprint adhesives tied by BELIZE/BRITISH HONDURAS cds's. Taken on the first flight of the Sonderflugverkehr line and hanstamped by violet rubber SONDERFLUGVERKEHR/LEIPZIGER/BRUHBAHRSMESSE 1963 commemoration handstamp. No message as always with these. 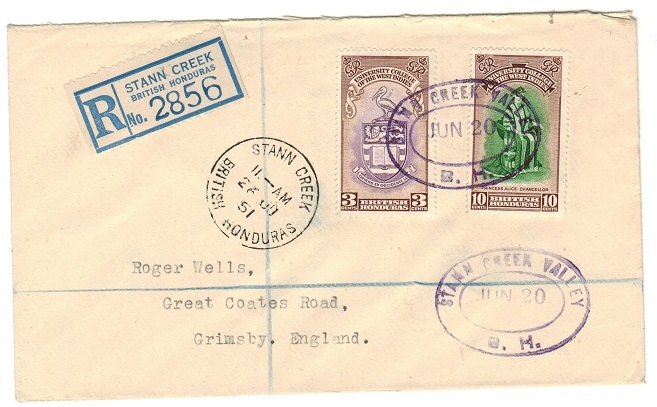 BRITISH HONDURAS - 1951 registered cover to UK used at STANN CREEK VALLEY. 1951 (JUN.20) registered cover to UK bearing 'University' pair (SG 176-77) tied by oval STANN CREEK VALLEY B.H. cancel in violet. Addiss type TDO-1. STANN CREEK registered label at left with STANN CREEK transit. 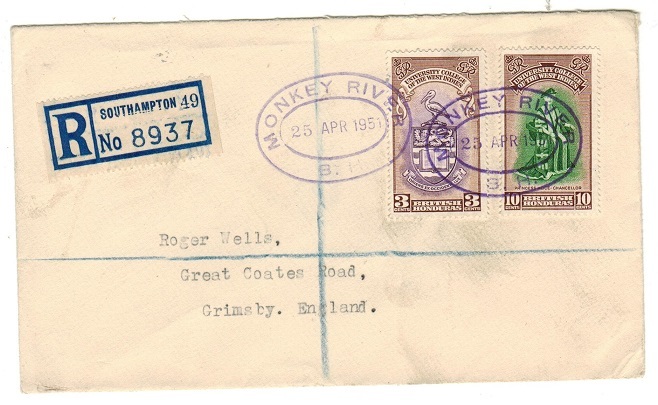 BRITISH HONDURAS - 1951 registered cover to UK used at MONKEY RIVER. 1951 (APR.25) registered cover to UK bearing 'University' pair (SG 176+77) tied by oval MONKEY RIVER B.H. cancel in violet. Addiss type TDO-1a. BRITISH HONDURAS - 1947 registered cover to UK used at SAN PERDRO. 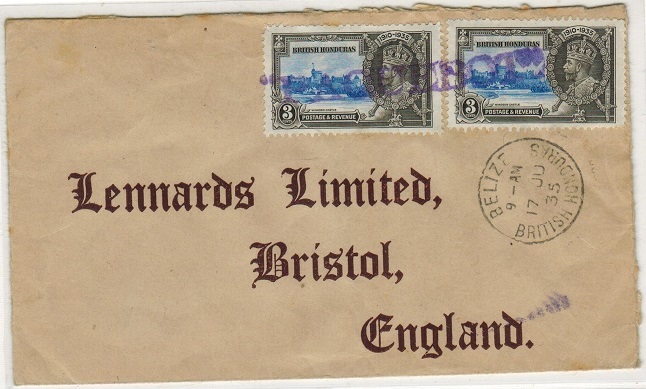 1947 (JAN.23) registered cover to UK bearing 3c pair & 5c (SG 152+63) tied by oval SAN PEDRO B.H. cancel in violet. Addiss type TDO-1. BELIZE O/BRITISH HONDURAS registered label at left. 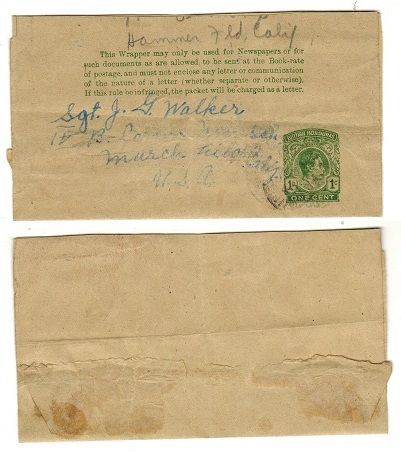 BRITISH HONDURAS - 1938 1c green postal stationery wrapper (faults) used to USA. H&G 4. 1938 1c green and buff postal stationery wrapper (trimmed) cancelled by indistict BELIZE/BRITISH HONDURAS cds. Faults but scarce. H&G 4. BRITISH HONDURAS - 1942 (circa) 5c rate censor cover to USA. 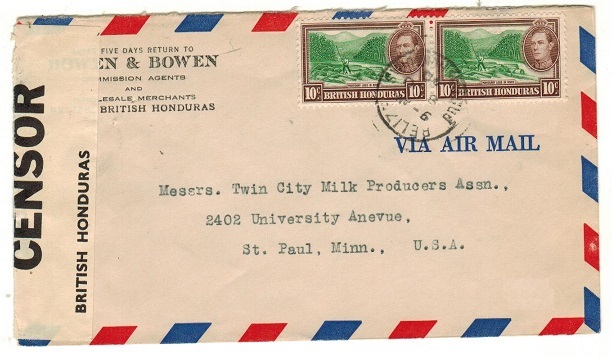 1942 (circa) commercial cover addressed to USA bearing 5c adhesive tied by weak cds and with black on cream OPENED BY/CENSOR/BRITISH HONDURAS censor label at left. 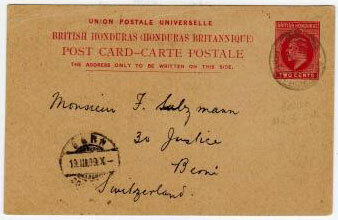 BRITISH HONDURAS - 1917 3c rate postcard use to Malta. 1917 (FE.26.) 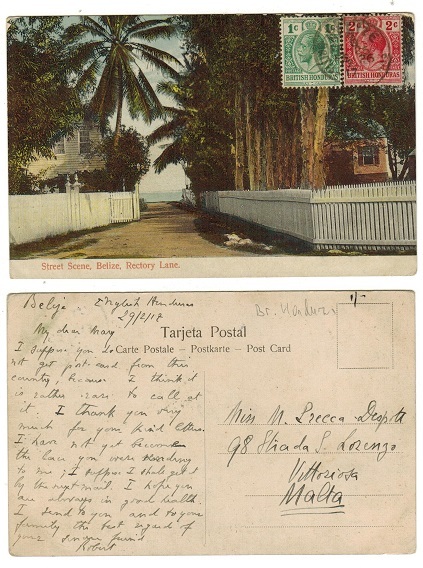 use of picture postcard addressed to Malta (scarce destination) depicting 'Street Scene, Belize, Rectory Lane' bearing 1c and 2c adhesives tied on the picture side by BELIZE/ BRITISH HONDURAS cds. 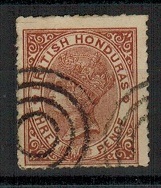 BRITISH HONDURAS - 1901 use of USA 2c PSE with QV 5c added at BELIZE. 1901 (MY.17.) 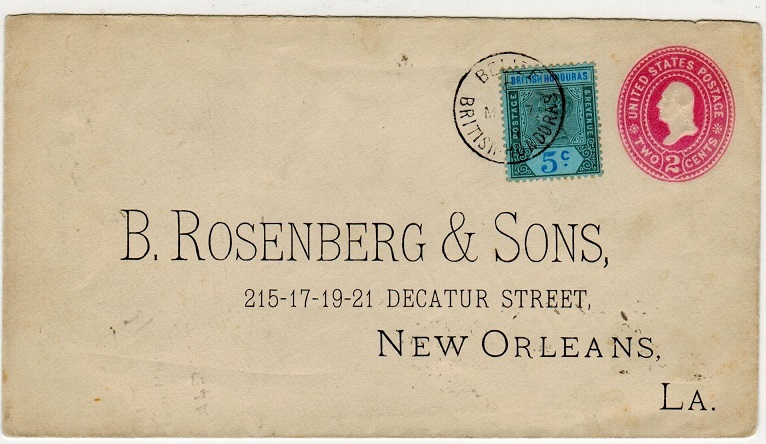 use of USA 2c postal stationery envelope with pre-printed address addressed to New Orleans and bearing British Honduras 5c adhesive (SG 55) tied by BELIZE/BRITISH HONDURAS cds and with 'W.Forman/Dealers in/Boots and Shoes/Belize' commercial rubber h/s on reverse. An unusual use of this US stationery in Br.Honduras. BRITISH HONDURAS - 1918 3c cover to USA with scarcer P.O.BELIZE cancel. 1918 (OCT.7) cover to USA bearing 3c (SG103) tied by fine P.BELIZE.O/BRITISH HONDURAS d/r TRD in black. BRITISH HONDURAS - 1902 2c purple and black on red fine used with INVERTED WATERMARK. SG 81w. 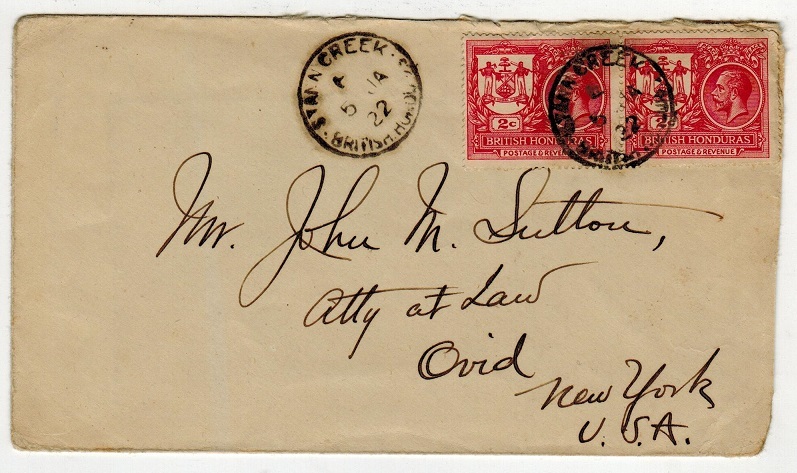 1902 2c purple and black on red adhesive in fine used condition showing the variety WATERMARK INVERTED. SG 81w. BRITISH HONDURAS - 1917 1c 'War' strip of three on cover to UK. 1917 (AP.26.) 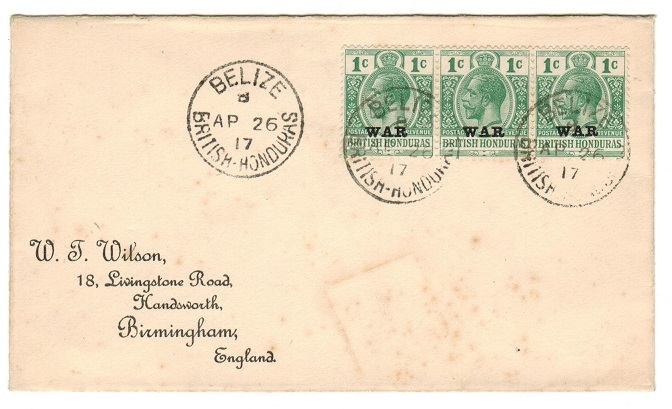 'Wilson' cover addressed to UK (small light tone patch on front) bearing a fine strip of three of the 1c green adhesive overprinted WAR in black (SG 119) tied BELIZE/BRITISH HONDURAS. 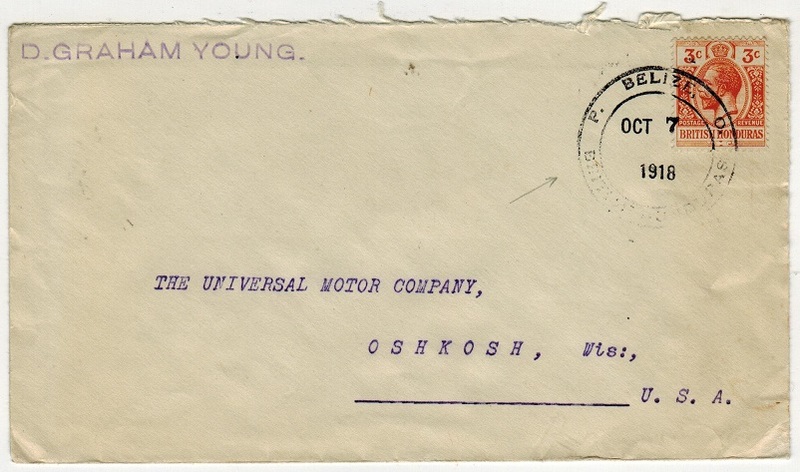 BRITISH HONDURAS - 1911 5c rate cover to USA used at BELIZE. 1911 (AU.4.) cover to USA bearing 1c and 2c (x2) adhesives tied by BELIZE/BRITISH HONDURAS cds's. BRITISH HONDURAS - 1944 censored cover to USA used at COROZAL. 1944 (SP.14.) 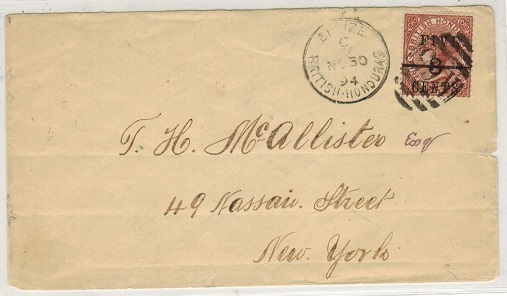 cover addressed to USA bearing 1c,5c and 15c adhesives tied COROZAL/BRITISH HONDURAS and with black on white P.C.90/OPENED BY EXAMINER/ J/8171 censor label at left. BRITISH HONDURAS - 1946 'Victory' pair mint with local SPECIMEN h/s in violet. SG 162-63. 1946 'Victory' pair (SG 162-63) in fine mint mounted mint condition each handstamped SPECIMEN diagonally in violet. Status unknown. BRITISH HONDURAS - 1938 2c PSC unused with black diagonal SPECIMEN on front. H&G 17. 1938 2c carmine on buff postal stationery postcard in fine unused condition struck by black diagonal SPECIMEN on front. H&G 17. BRITISH HONDURAS - 1941 6c rate censor cover to USA. 1941 (NO.28.) 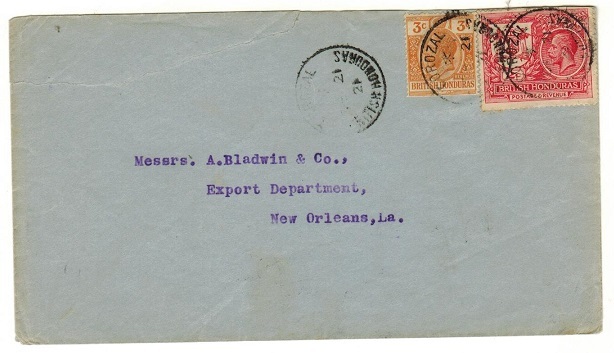 commercial cover addressed to USA bearing 3c adhesive pair (one torn) cancelled BELIZE/BRITISH HONDURAS weith black on white OPENED BY/CENSOR/BRITISH HONDURAS label at left. (Miller type CL2). BRITISH HONDURAS - 1953 $10+5c POSTAL ORDER unused. 1953 (circa) $10+5c olive green and brown on cream (QEII head type) BRITISH HONDURAS/POSTAL ORDER in fine unused condition with couterfoil still attached. 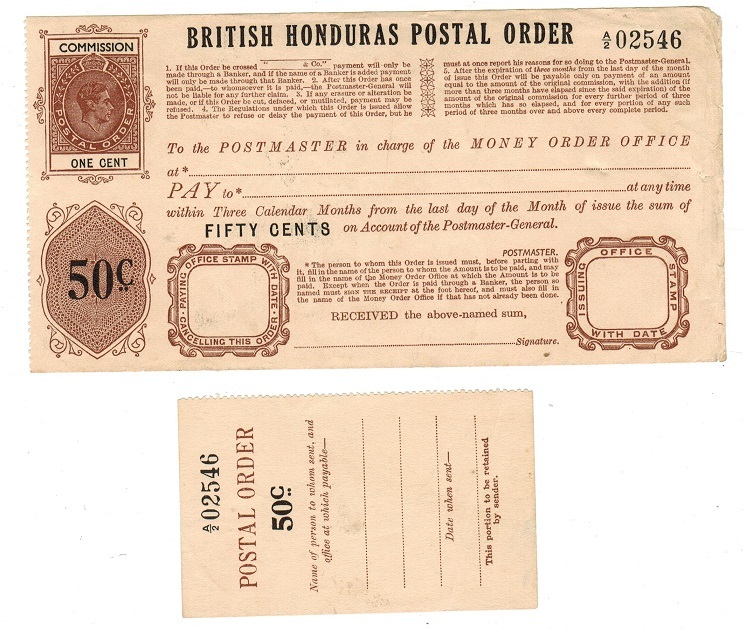 BRITISH HONDURAS - 1953 $5+4c POSTAL ORDER unused. 1953 (circa) $5+4c purple and brown on cream (QEII head type) BRITISH HONDURAS/POSTAL ORDER in fine unused condition with couterfoil still attached. BRITISH HONDURAS - 1953 $3+3c POSTAL ORDER unused. 1953 (circa) $3+3c black and brown on cream (QEII head type) BRITISH HONDURAS/POSTAL ORDER in fine unused condition with couterfoil still attached. BRITISH HONDURAS - 1953 $2+2c POSTAL ORDER unused. 1953 (circa) $2+2c black and brown on cream (QEII head type) BRITISH HONDURAS/POSTAL ORDER in fine unused condition with couterfoil still attached. BRITISH HONDURAS - 1953 $1+1c POSTAL ORDER unused. 1953 (circa) $1+1c black and brown on cream (QEII head type) BRITISH HONDURAS/POSTAL ORDER in fine unused condition with couterfoil still attached. BRITISH HONDURAS - 1937 25c+1c POSTAL ORDER unused. 1937 'KGVI' 25c+1c (commisssion) brown and black on cream BRITISH HONDURAS POSTAL ORDER in fine unused condition and complete with original counter foil. Very scarce. BRITISH HONDURAS - 1937 50c+1c POSTAL ORDER unused. 1937 'KGVI' 50c+1c (commisssion) brown and black on cream BRITISH HONDURAS POSTAL ORDER in fine unused condition and complete with original counter foil. Very scarce. 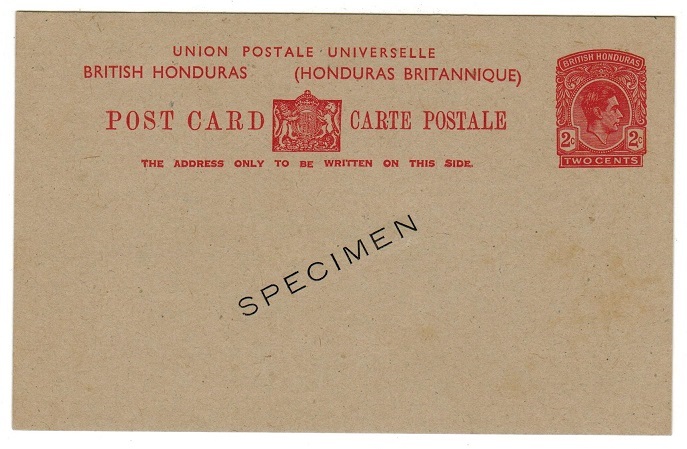 BRITISH HONDURAS - 1937 75c+1c POSTAL ORDER unused. 1937 'KGVI' 75c+1c (commisssion) brown and black on cream BRITISH HONDURAS POSTAL ORDER in fine unused condition and complete with original counter foil. Very scarce. BRITISH HONDURAS - 1913 2c carmine PSC SPECIMEN. H&G 16. 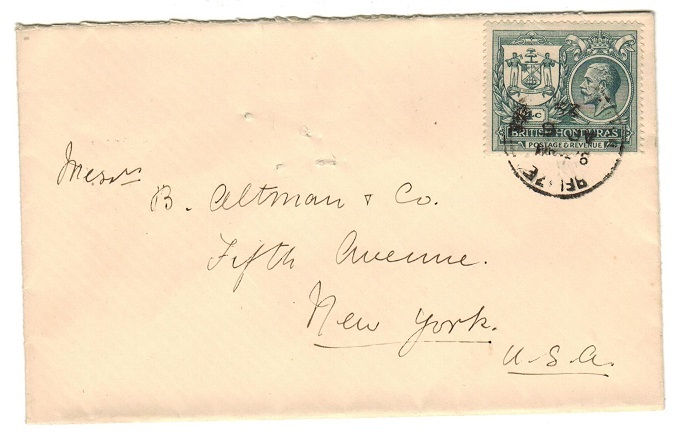 1913 2c carmine on buff postal stationery postcard in unused condition with diagonal SPECIMEN ovpt. in black. H&G 16. 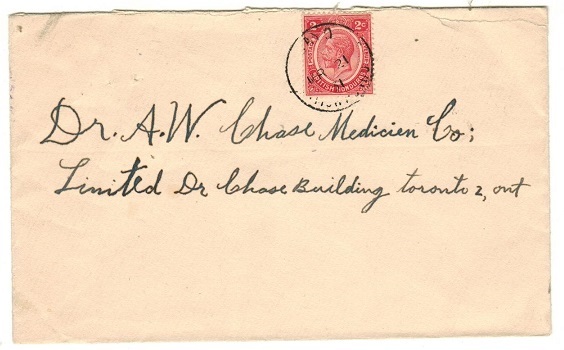 BRITISH HONDURAS - 1922 4c rate cover to USA used at STANN CREEK. 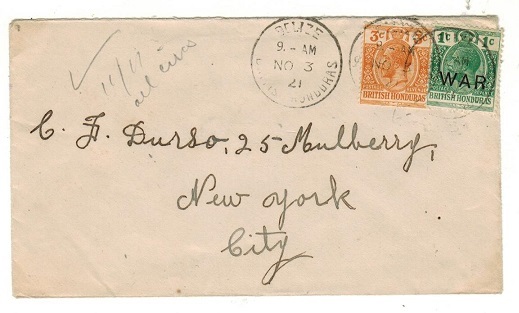 1922 (JA.5) cover to USA bearing 2c pair (SG 121) tied by STANN CREEK/BRITISH HONDURAS cds with similar strike alongside. 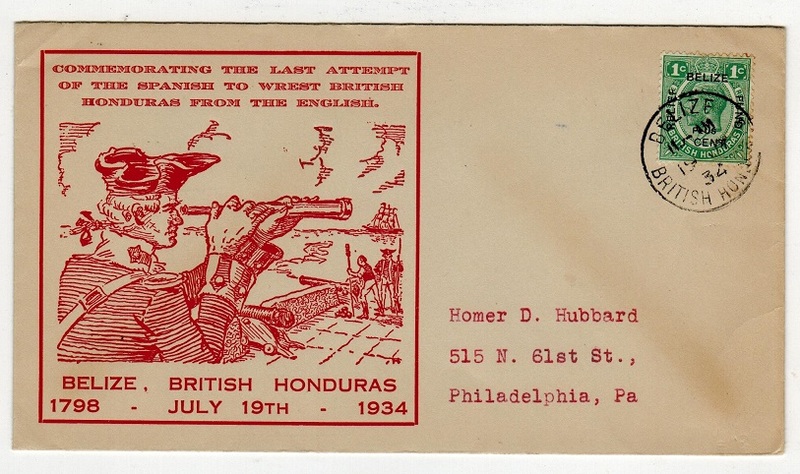 BRITISH HONDURAS - 1932 'Last Attempt of Spanish' commemoration illustrated cover to USA. 1932 (My.19) Illustrated 'Last Attempt of Spanish to take British Honduras' red on white commemoration cover addressed to USA & bearing 1c+1c (SG138) tied BELIZE. 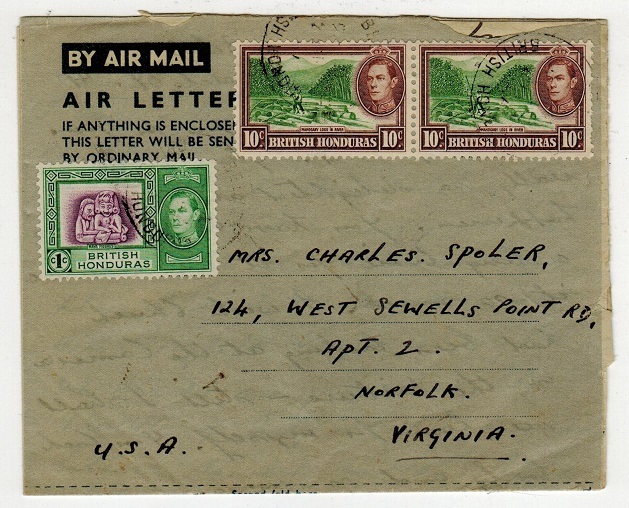 BRITISH HONDURAS - 1947 FORMULA 'Air Letter' use to USA. 1947 (MAR.27.) 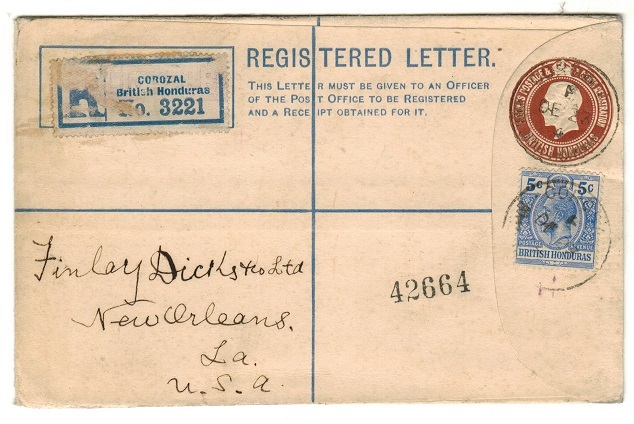 use of dark blue on greyish overlay FORMULA air letter addressed to USA (long internal message) bearing 1c and 10c adhesive pair tied by part BELIZE/BRITISH HONDURAS cds's. BRITISH HONDURAS - 1961 British Forces cover use to UK with BRITISH TROOPS cachet from BELIZE. 1961 (APR.1.) 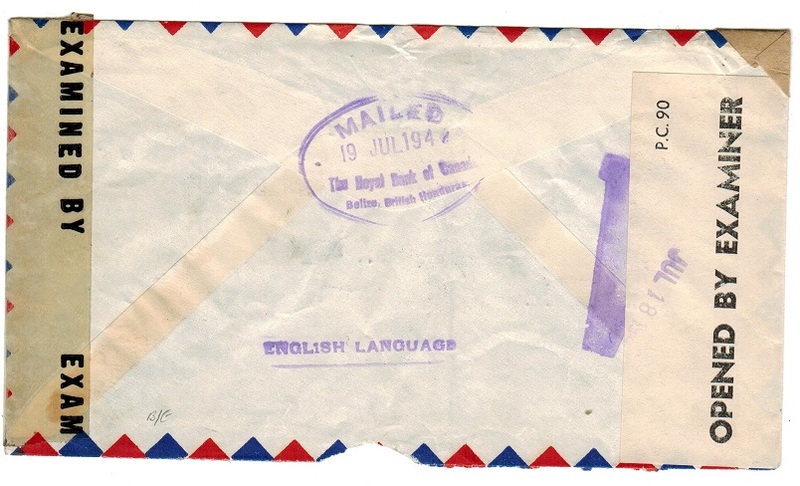 cover addressed to UK marked 'Forces Air mail' and bearing QEII 5c pair tied by BELIZE cds with violet three lined FORCES MAIL/BRITISH TROOPS/BELIZE handstamp. BRITISH HONDURAS - 1903 5c rate cover to USA used at BELIZE. 1903 (MR.20.) 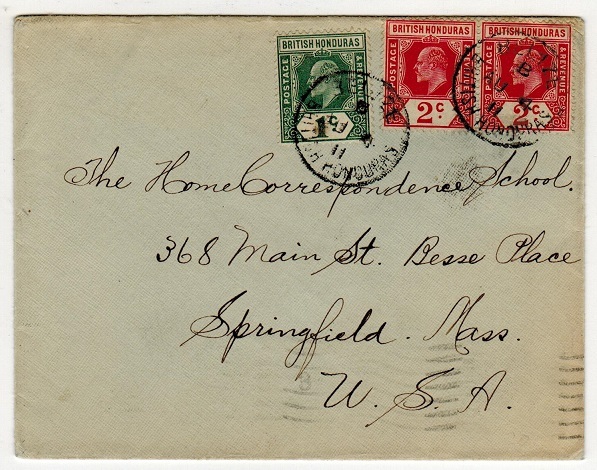 cover addressed to USA bearing 5c (SG 82) tied BELIZE/BRITISH HONDURAS. BOSTON-CHELSEA RECEIVED STATION oval b/s. BRITISH HONDURAS - 1938 2c+3c brown RPSE unused (size G). H&G 5. 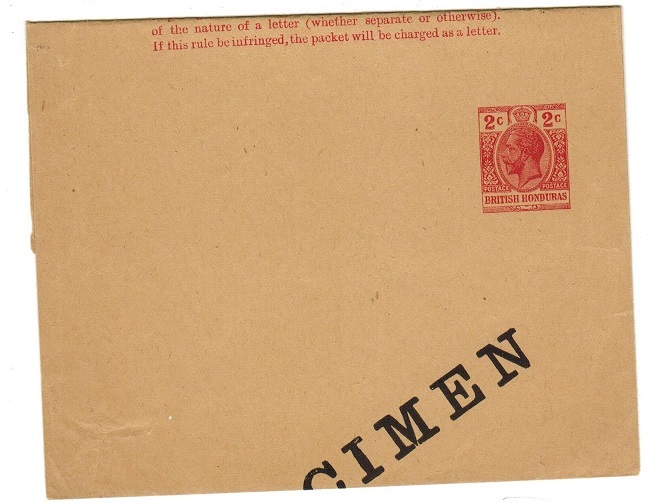 1938 2c+3c brown on cream registered postal stationery envelope (size G) in fine unused condition. Thos De La Rue & Co. Ltd. Patent imprint under flap. H&G 5. BRITISH HONDURAS - 1941 6c rate censor cover to USA used at BELIZE. 1941 (OC.31.) 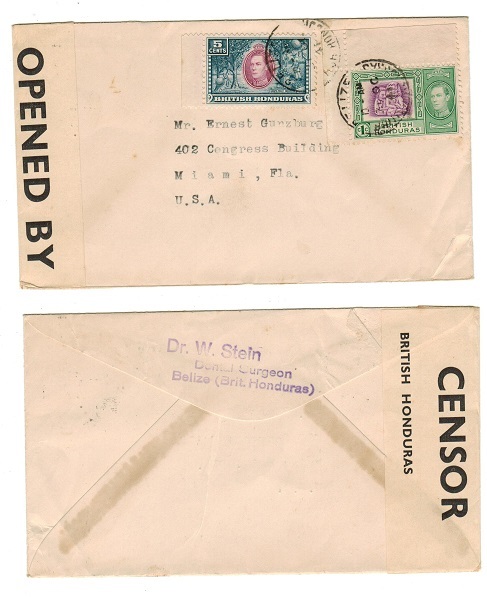 cover addressed to UK bearing 1c and 5c adhesives tied by BELIZE/BRITISH HONDURAS cds's with black on white OPENED BY/CENSOR/BRITISH HONDURAS label at left. BRITISH HONDURAS - 1929 inward first flight cover from Miami by FAM 5. 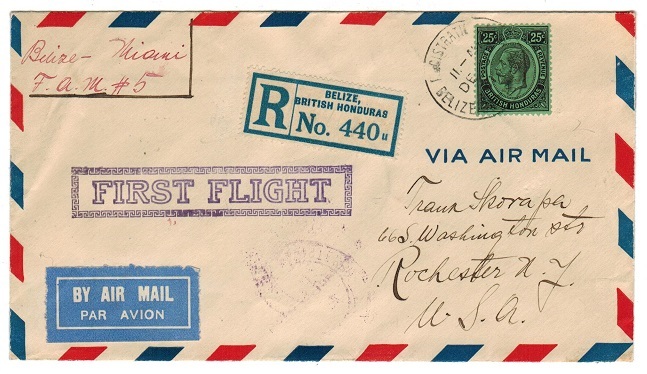 1929 (MAY.21) inward first flight cover from Miami in USA cacheted with violet boxed FIRST FLIGHT/AIR MAIL/MIAMI-CENTRAL AMERICAN/FAM ROUTE 5 cachet with BELIZE arrival b/s dated 21.MY.29. BRITISH HONDURAS - 1937 'Belize-Cayo' first flight cover. 1937 (AU.17.) 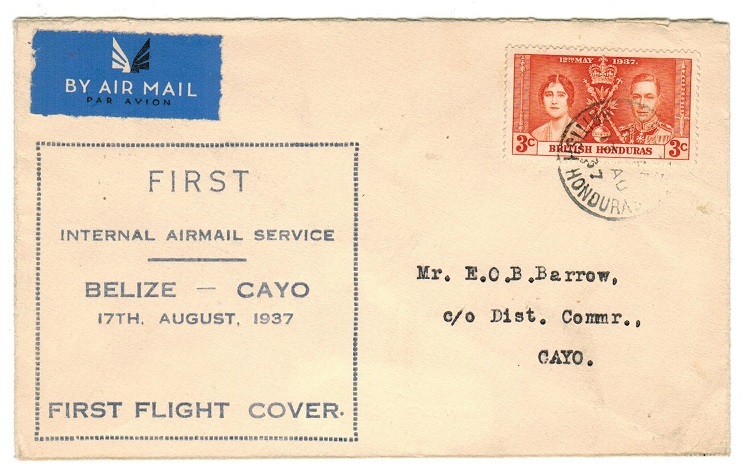 pre-printed FIRST/INTERNAL AIR MAIL SERVICE/BELIZE-CAYO first flight cover addressed to Cayo and bearing 3c 'Coronation' adhesive tied by BELIZE cds. Only 129 flown. BRITISH HONDURAS - 1920 1c green postal stationery wrapper unused and struck SPECIMEN. H&G 1. 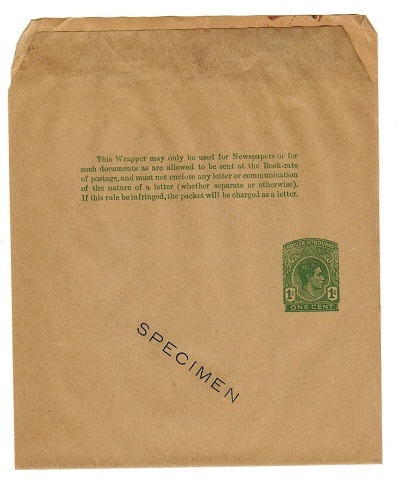 1920 1c green on buff postal stationery wrapper in unused condition (a little aged) with diagonal SPECIMEN in black. H&G 1. 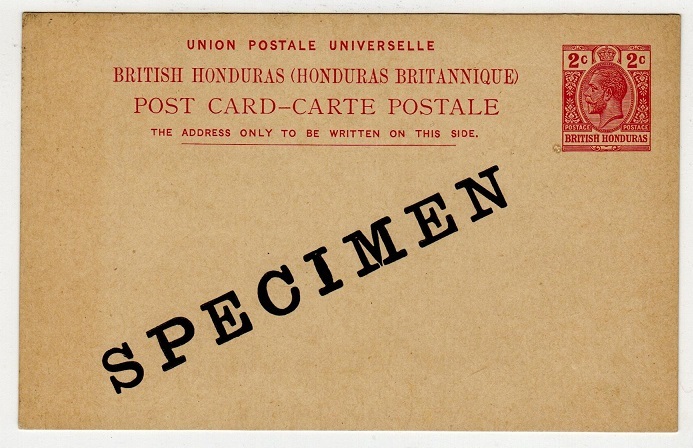 BRITISH HONDURAS - 1920 2c red postal stationery wrapper unused and struck SPECIMEN. H&G 2. 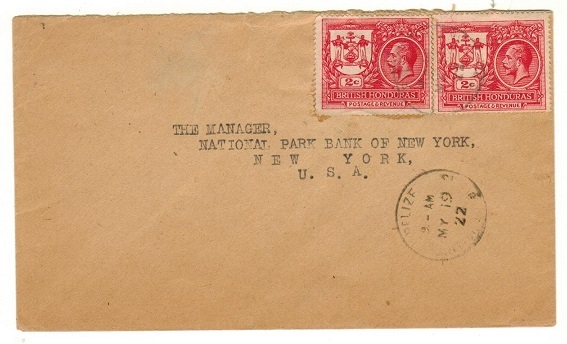 1920 2c red on buff postal stationery wrapper in unused condition with diagonal SPECIMEN in black. H&G 2. BRITISH HONDURAS - 1929 4c rate cover to USA used at BELIZE. 1929 (AP.6.) cover addressed to USA bearing the 4c grey (SG 123) tied by BELIZE cds. BRITISH HONDURAS - 1938 1c green postal stationery wrapper SPECIMEN. H&G 4. 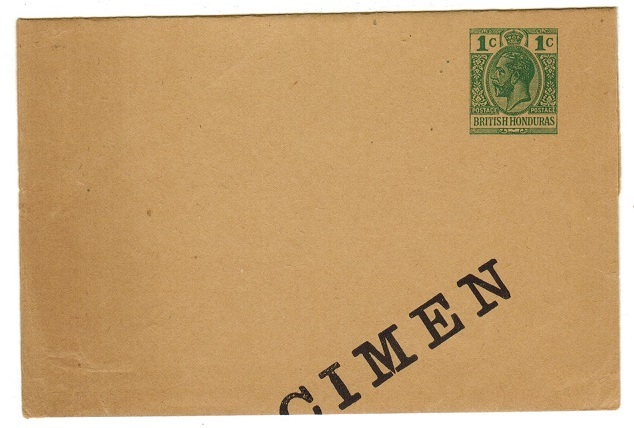 1938 1c green on buff postal stationery wrapper in unused condition overprinted SPECIMEN diagonally. H&G 4. BRITISH HONDURAS - 1939 first flight cover from Punta to Belize. 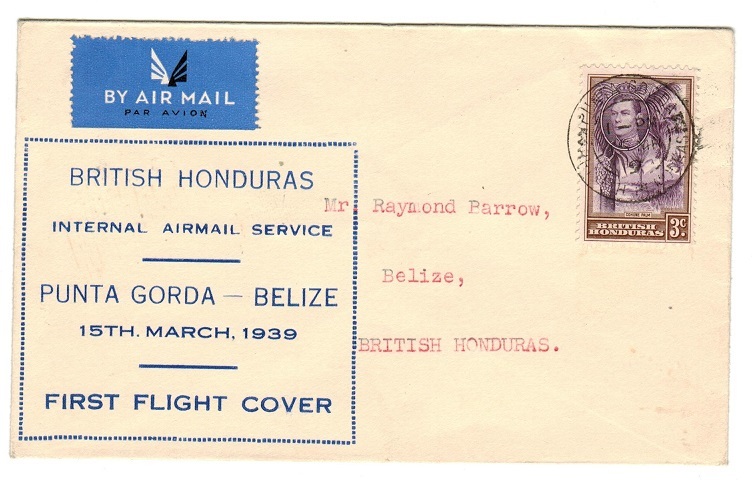 1939 (MR.15) first flight cover to Belize bearing 3c adhesive tied PUNTA GORDA/BRITISH HONDURAS & cacheted at left by blue boxed INTERNAL AIRMAIL SERVICE/PUNTA GORDA-BELIZE. BRITISH HONDURAS - 1953 10c postal stationery wrapper to Holland used at BELIZE. H&G 1. 1953 10c brown and light blue postal stationery air letter addressed to Holland (genuine use) cancelled by BELIZE/BRITISH HONDURAS cds dated 20.JY.55. H&G 1. BRITISH HONDURAS - 1937 PAQUEBOT/KINGSTON JAMAICA use on 5c 'Coronation' cover to USA. 1937 (SP.13.) cover addressed to USA bearing Br.Honduras 5c 'Coronation' adhesive tied by fine PAQUEBOT KINGSTON JAMAICA cds with violet two lined MAILED AT SEA/R.M.S. CONNECTOR maritime h/s at lower left. BRITISH HONDURAS - 1944 censor cover to USA with 'J/8174' label at left used at BELIZE. 1944 commercial cover addressed to USA bearing 1c and 5c (x4) tied by light BELIZE cds's and with black on white P.C.90/OPENED BY EXAMINER/ J/8174 censor label at left (Little type CL9) with clear US censor label applied at right on arrival. BRITISH HONDURAS - 1937 KGVI 50c+1c POSTAL ORDER unused. 1937 'KGVI' 50c+1c (commission) brown and black on cream BRITISH HONDURAS POSTAL ORDER in fine unused condition and complete with (detached) original counter foil. BRITISH HONDURAS - 1872 3d red-brown SPIRO FORGERY with bogus target ringed cancel. 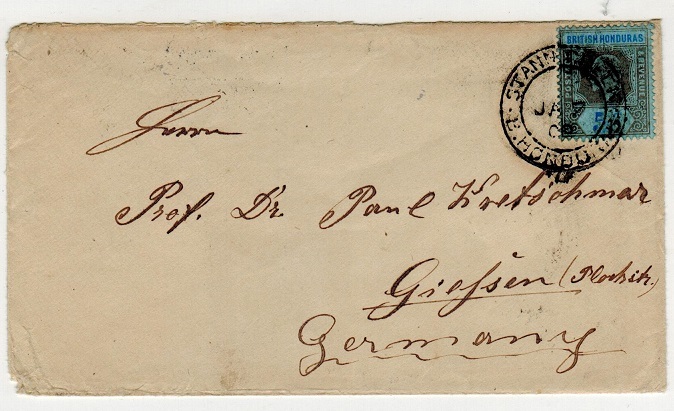 1872-79 3d red-brown (SG type 1) SPIRO FORGERY on unwatermarked paper and cancelled by ringed 'target' cancel. BRITISH HONDURAS - 1890 3c on 5c PSC uprated with 2c adhesive to Austria. H&G 4. 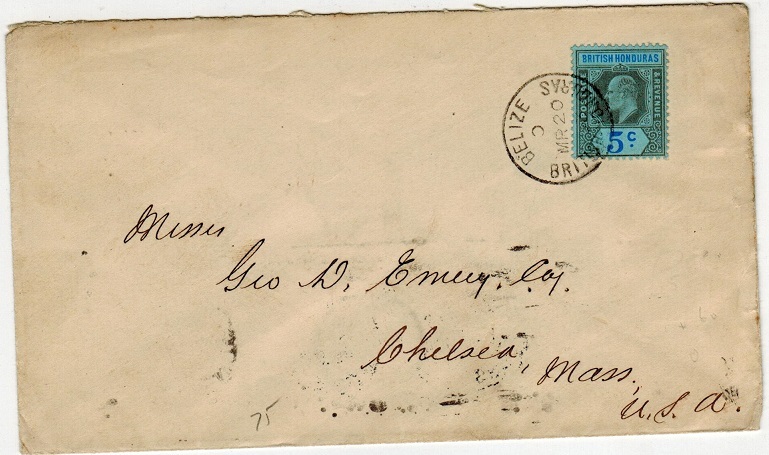 1890 3c black on 5c brown on cream postal stationery postcard addressed to Austria (no message) bearing additional KEDW VII 2c adhesive tied by BELIZE/BRITISH HONDURAS cds dated SP.4.12. SALZBURG arrival cds at left. H&G 4. 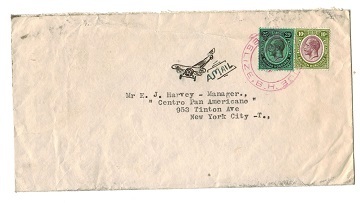 BRITISH HONDURAS - 1933 airways P.A.A.OFFICE cover to USA. 1933 (MAR.15.) 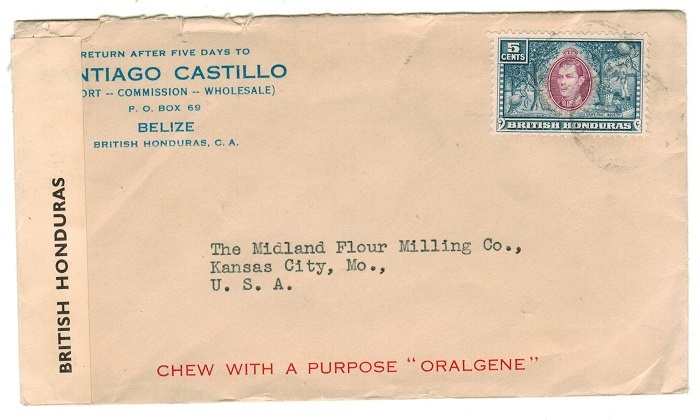 cover addressed to USA (a little aged) bearing 10c and 25c adhesives tied by d/r P.A.A.OFFICE/BELIZE. B.H. 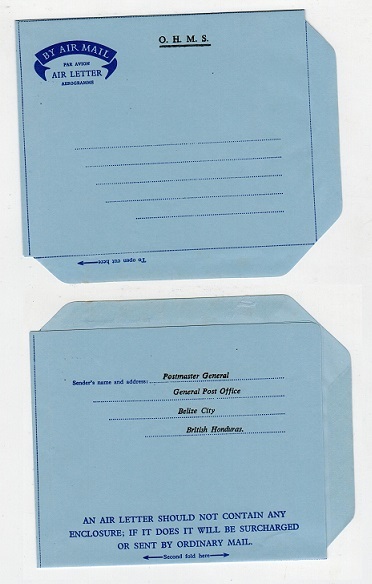 rubber cancellator from the Pan American Airways Office struck in magenta. In use for less than two years. Proud type D2. 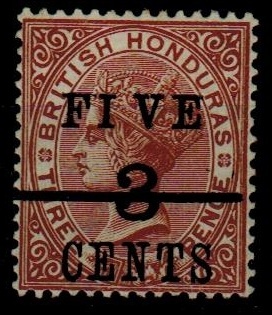 BRITISH HONDURAS - 1891 5c on 3c on 3d red-brown mint with WIDE SPACE variety. SG49A. 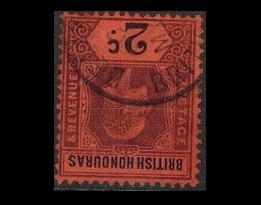 1891 5c on 3c on 3d red-brown in fine mint condition showing the WIDE SPACE BETWEEN I AND V variety. SG49a. BRITISH HONDURAS - 1899 $2 green and ultramarine (SG 64) postal FORGERY. 1899 $2 green & ultramarine adhesive (SG 64) used FORGERY. Printed on CA watermarked paper & very scarce. BRITISH HONDURAS - 1923 4c black 'Postage Due' with INVERTED WATERMARK. SG D3W. 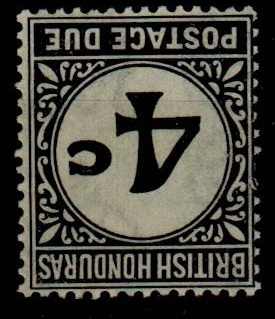 1923 4c Black 'Postage Due' in fine mint condition showing the variety WATERMARK INVERTED. Very scarce. SG D3W. BRITISH HONDURAS - 1915 2c+3c brown on cream RPSE (size H2) unused. H&G 3a. 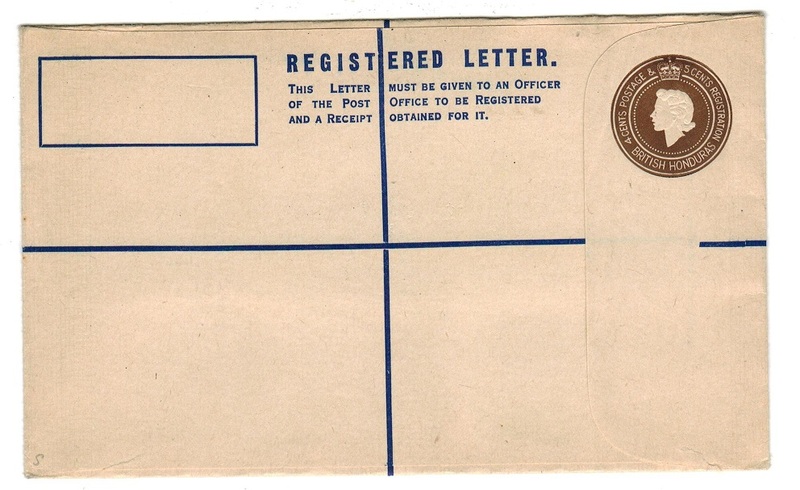 1915 2c+3c brown on cream registered postal stationery envelope (size H2) in unused condition (some very light age spotting) with 'Thos De La Rue & Co. Ltd. Patent' imprint under flap. H&G 3a. BRITISH HONDURAS - 1955 2c+3c RPSE (size G) unused. H&G 6. 1955 2c+3c brown on cream registered postal stationery envelope (size G) in fine unused condition. H&G 6. BRITISH HONDURAS - 1970 4c+5c RPSE (size G) unused. H&G 8. 1970 4c+5c brown on cream registered postal stationery envelope (size G) in fine unused condition. H&G 8. 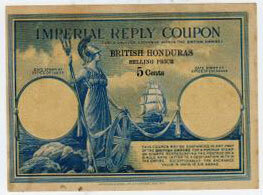 BRITISH HONDURAS - 1937 (circa) 5c IMPERIAL REPLY COUPON. 1937 circa blue on yellow-cream 'Britannia' type 5c IMPERIAL REPLY COUPON printed by Harrison & Sons Ltd and with 'G VI R' watermark. A fine unused example overprinted in bluish- black BRITISH HONDURAS/SELLING PRICE/5 CENTS. Fine and scarce. BRITISH HONDURAS - 1902 2c PSC used. H&G 13. 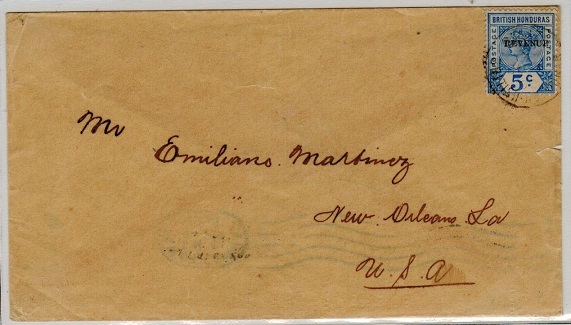 1902 2c carmine on buff postal stationery postcard addressed to Switzerland with genuine message regarding the 1c and 2c stationery cards cancelled by BELIZE/BRITISH HONDURAS cds dated MR.3.1909. BERN arrival cds on front. H&G 13.